Providing you the best range of sugarcane bagasse briquetting machine and sugarcane bagasse briquettes plant with effective & timely delivery. The sugarcane bagasse is used for the manufacturing of the bio fuel briquettes through the use of eco-convenient briquetting machine. The sugarcane bagasse briquetting machine is manufactured through the high quality materials and equipment that enable their faultless performance. We are amongst the recognized manufacturers and suppliers of sugarcane bagasse briquettes plant. 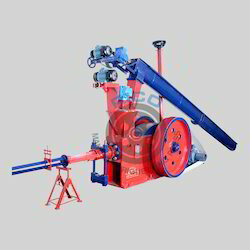 This type of briquette plants machinery is used for the reprocessing of sugarcane bagasse to produce white coal briquettes without use of any type of binders or any chemicals. The bagasse briquette making machine is an innovative technology through which one can contribute in making our environment cleaner and greener. The high quality bagasse briquette machine is a cost effective fuel providing technology. We are offering the sugarcane bagasse briquette machine at very reasonable cost.